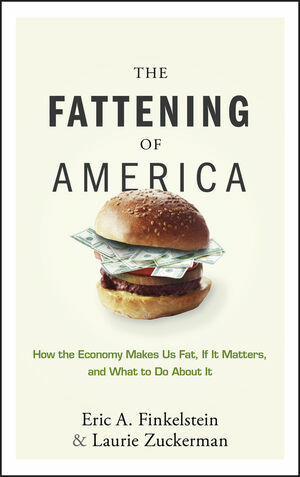 In The Fattening of America, renowned health economist Eric Finkelstein, along with business writer Laurie Zuckerman, reveal how the U.S. economy has become the driving force behind our expanding waistlines. Blending theory, research, and engaging personal anecdotes the authors discuss how declining food costs—especially for high-calorie, low-nutrient foods—and an increasing usage of technology, which make Americans more sedentary, has essentially led us to eat more calories than we burn off. Eric A. Finkelstein, PhD, MHA, is a nationally acclaimed expert on the subject of economics and obesity. He is a health economist with the research organization RTI International in Research Triangle Park, North Carolina, and teaches health economics at Duke University. His work focuses on the economic causes and consequences of health-related behaviors, with a primary emphasis on obesity. Finkelstein has published over thirty peer-reviewed articles on the economics of obesity and related behaviors. His research has been featured on the front page of USA Today and has been covered in the Economist, the New York Times, Forbes, the Washington Post, and many other newspaper, radio, and television outlets. Laurie Zuckerman left her corporate PR job in 1999 to make writing her full-time career. She contributes columns and feature articles to a number of business journals and lifestyle magazines, and writes for businesses ranging from Fortune 500s to startups, with a focus on health care, high tech, and business. Introduction: Answering the Age-Old Question: Why Is Uncle Al So Fat? Chapter 1 Craze or Crisis? My Soccer Team Eats Oranges. So How about Adults? Are We Gaining, Too? A Growing Waistline Can Be Bad for Your Health. But Are We the Only Ones Gaining Weight? The Longer You Stay, the Bigger You Get. Chapter 2 I’ll Take a Deep-Fried Coca-Cola. The Rise of French-Fried Potatoes. Please Pass the High-Fructose Corn Syrup. A Full Pound of Sausage, Bacon, and Ham: Have a Meaty Morning. Kids Are Also Drinking the Kool-Aid. Chapter 3 Why We’re Moving Less (Hint: It’s Not Just the La-Z-Boy). But I Don’t Have Time! Not Quite the Jetsons, But . . . .
Just Be a Marathon Runner. Our Kids Are Also Slowing Down. Chapter 4 So Where Else Can We Lay the Blame? Then Just Blame Mom (You Know You Will Anyway). Blame the Cigs (One More Theory Goes Up in Smoke). Blame the Air Conditioner (Not Cool). Blame Pollution (It’s a Dirty Business). Blame That Nasty “Fat Bug”. Chapter 5 Beware: Moral Hazard. Just Bill My Health Insurance. Is Obesity as Bad as It Used to Be? Just Take a Pill or Get a Procedure. Chapter 6 So We’re Fat—Who Cares? C’mon Now, We’re Only Utility Maximizing. Now, Let’s Tear This Argument Apart (and Put It Back Together). So Should Dad (and the Government) Care that Uncle Al Is Obese? Chapter 7 The Role of Government. Is There a Role for Government? Chapter 8 Weighing the Public Policy Issues (for Adults). Chapter 9 Weighing the Public Policy Issues (for Kids). Your Mouth Will Really Groove. Chapter 10 The Employer’s Dilemma. Why Don’t Businesses Invest More in the Health of Their Workforce? The Dirty Secret about Employee Wellness Programs. So What’s an Employer to Do? Could These Programs Get Me in Legal Hot Water? Just How Big Is the Weight-Loss Industry? In the Name of Progress. Chapter 12 How to Lose Weight Like an Economist. A Few More Secrets to Success.